I haven’t done much writing this summer. My next book, a teacher’s memoir called “Crazy is Normal” is in beta stage and it—the manuscript—has been patiently waiting for me to start the final revisions and editing. And the posts that are still appearing on my Blogs were pretty much what I had already written and pre-scheduled back in June. But I have been sprouting ideas and keeping notes. No, I’m not suffering from writer’s block. Instead, I decided this summer to work around the house on several projects that I’ve been kicking around inside my head for years—after all, there are only so many hours in a day. 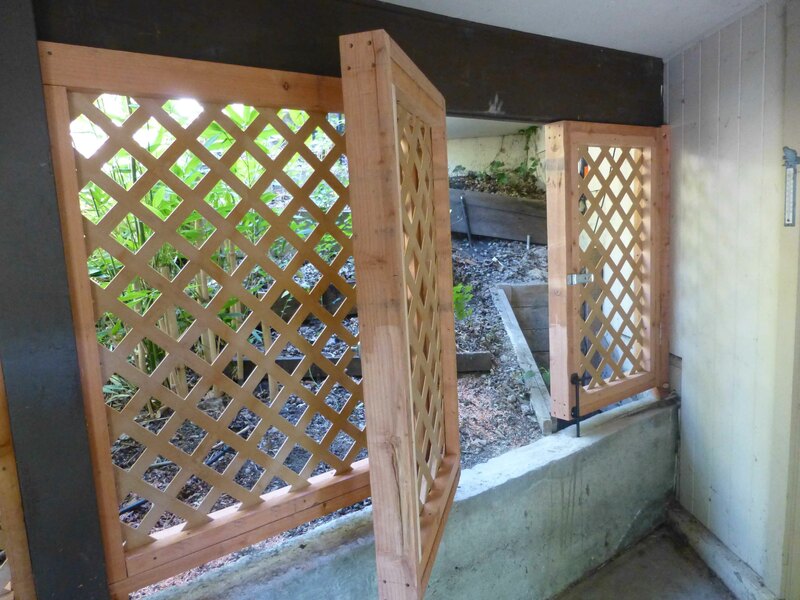 First, I built this redwood framed lattice fence with gates between the house and the detached garage. The back yard was mostly fenced except for this 16-foot opening. Like the thieves they are, the deer were slipping into the backyard at night through that space and eating my wife’s flowers and fruit. She is the gardener in the family. Then I moved on to three small projects: adding a photocell to a new, very bright LED spotlight that came with a motion detector so it wouldn’t go on during the day; fixing a few loose steps on one of the many outdoor stairways on our hillside property, and mixing two bags of cement for a pad to attach a hose-reel box to that I bought at Lowe’s. The 100 foot hose had always been a tangled mess before I installed that box with a crank handle. That job took more than week. After I mixed the concrete and poured it into a box frame, I waited for it to cure. While I waited, I started the last project—the toughest. 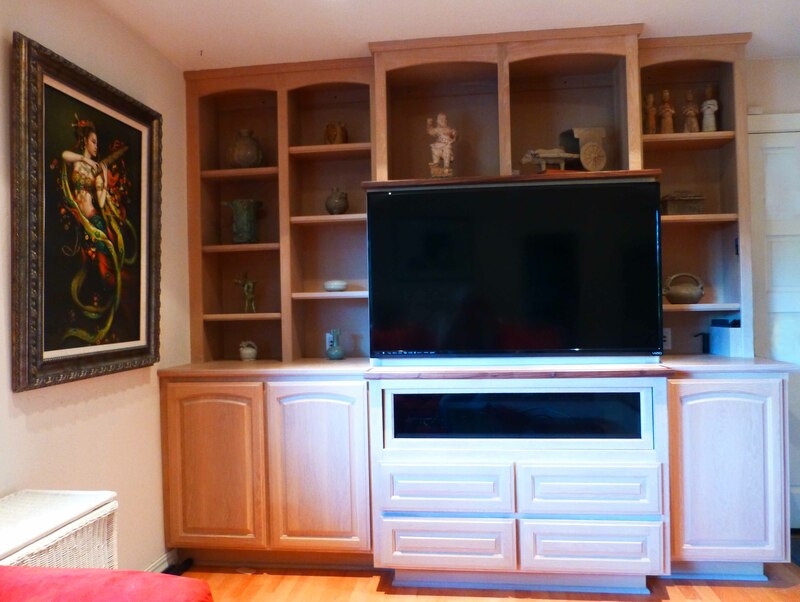 When we bought the house, the room where we watch TV had a nine-foot wide, floor to ceiling bookshelf-cabinet unit that housed a very large rear projection TV—basically a huge box that was about five-feet high and several-feet deep. 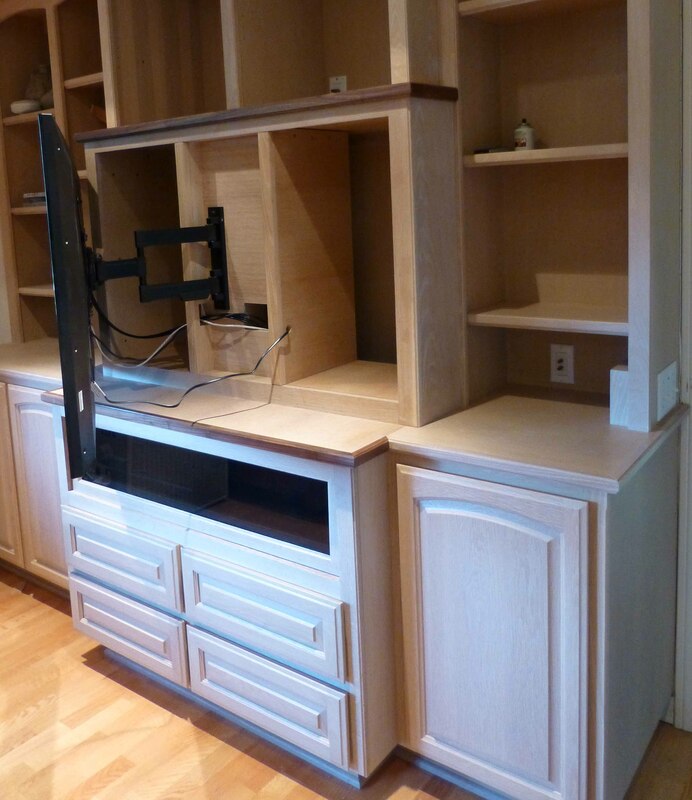 But we couldn’t stream TV programs from the Internet to that old, rear-projection TV, and I decided to upgrade to a 55 inch flat-screen. 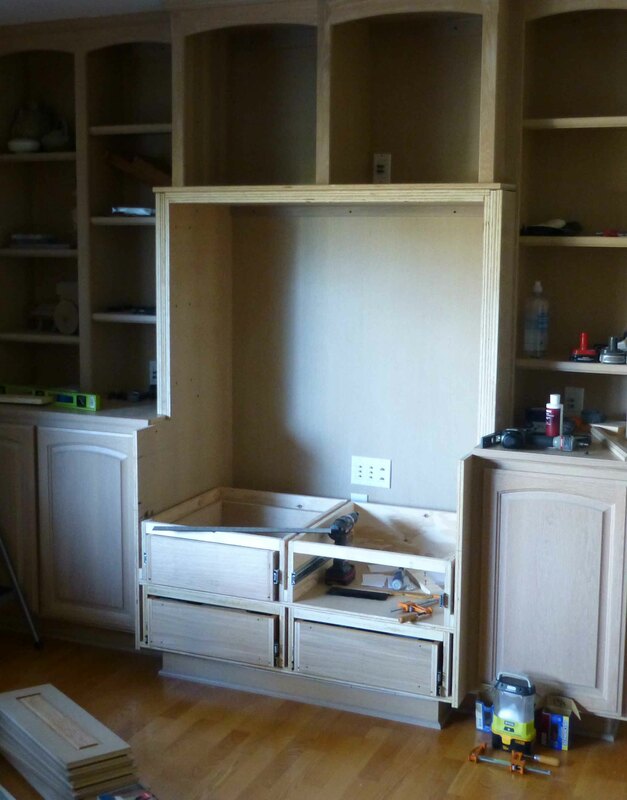 To achieve that meant remodeling the white-oak cabinet and shelf unit. My first idea was to have the job done until the price tag came in at $8,000 or more. 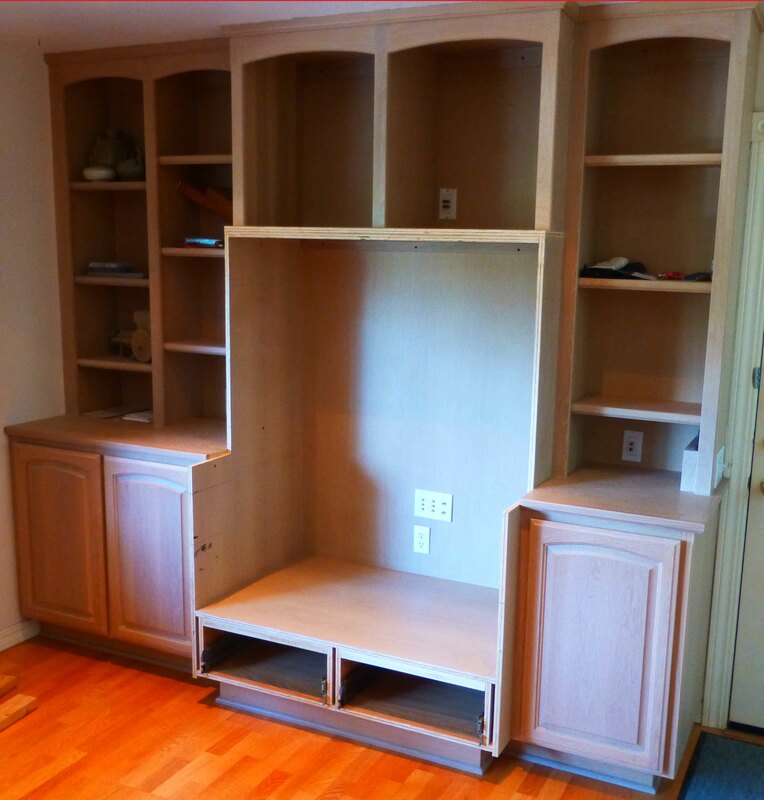 I have my own woodshop and have been into woodworking for decades so it was an easy decision to dust off the machines that hadn’t been in use for several years and shift gears from writing to cabinet work. The following photographs document the progress of this project. I’m not done yet but when it’s completed, I will start working on the revisions and editing for “Crazy is Normal, a classroom expose”. As you can see, I occasionally decide to take some time away from the blades and drills. My fingers have been itching for the keyboard so I decided to feed the writer’s beast that has been shouting inside my head to be let out. If I don’t listen, it gets really loud keeping me awake nights. I have almost finished the bottom half of the project. 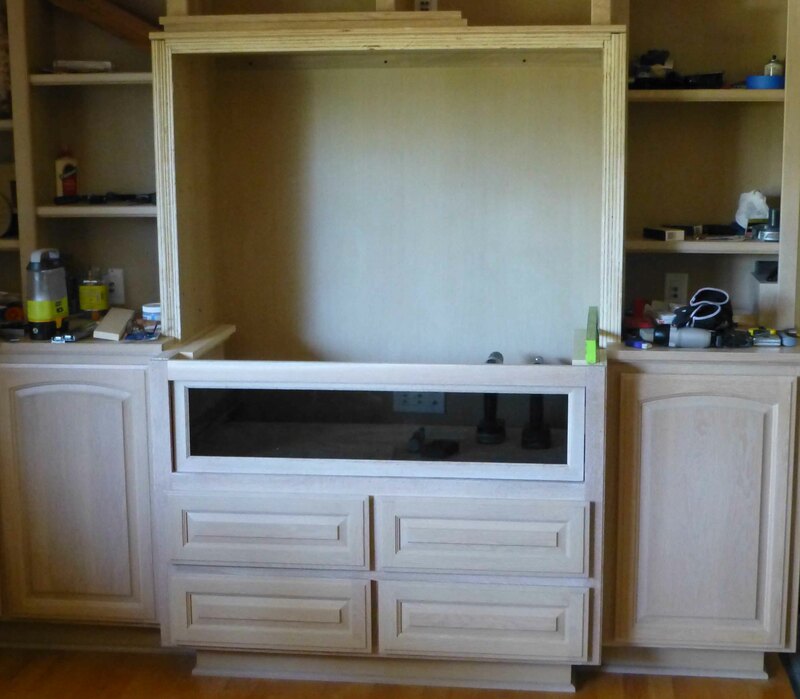 There’s sanding, filling and staining left before I start work on the top part where the flat screen TV will be attached. 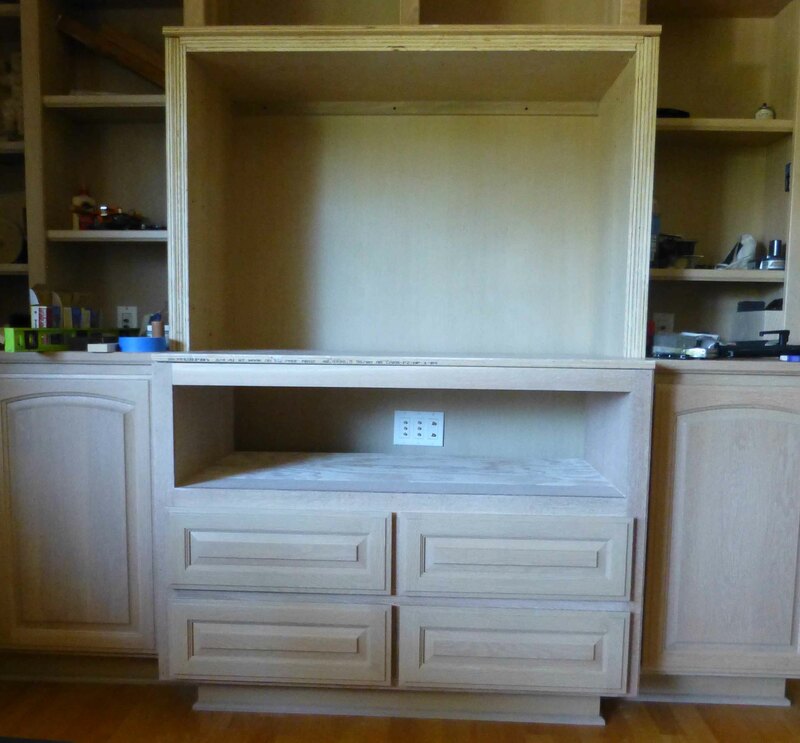 In the last photo for this update, you will see the top of a surge protector behind the pull out shelf. I have to move this to the right about two inches because it is blocking some connections in the wall behind it. 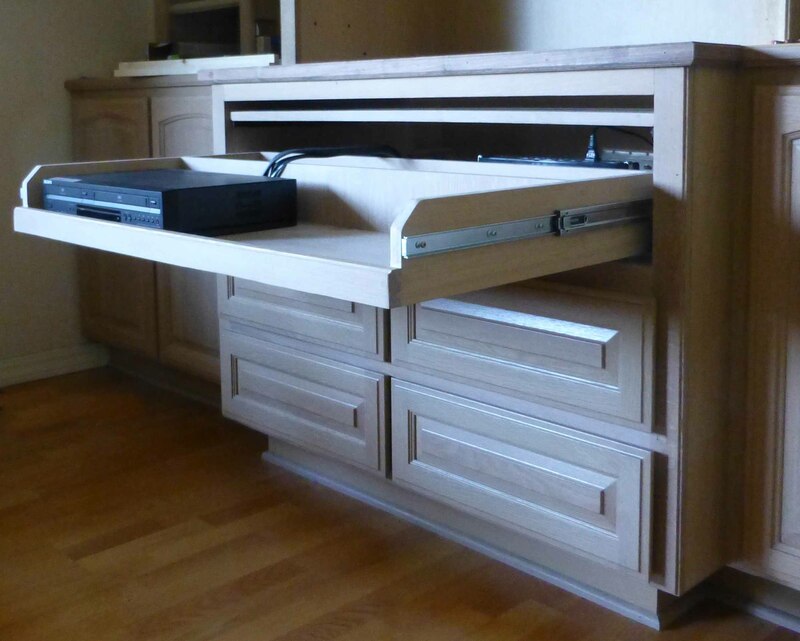 Behind the DVD/VCR player, there is a space designed to hold DVDs. I plan to drill a hole that will carry the input and power cords—out of sight—through that space, so they won’t have to go over it. 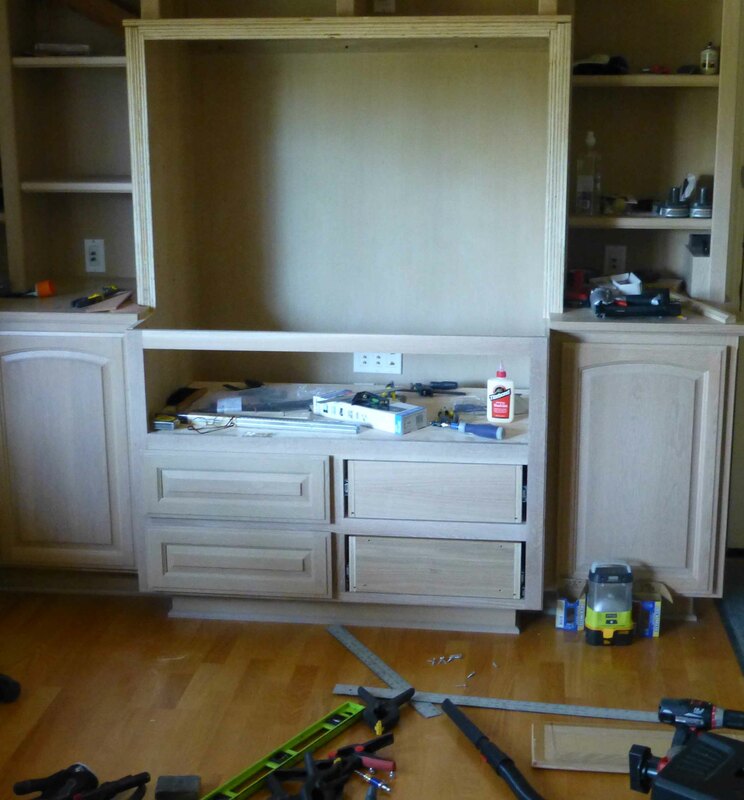 At this point, the project looks finished, and we can watch the 55″ flat screen TV, because all the components and the internet are wired in. 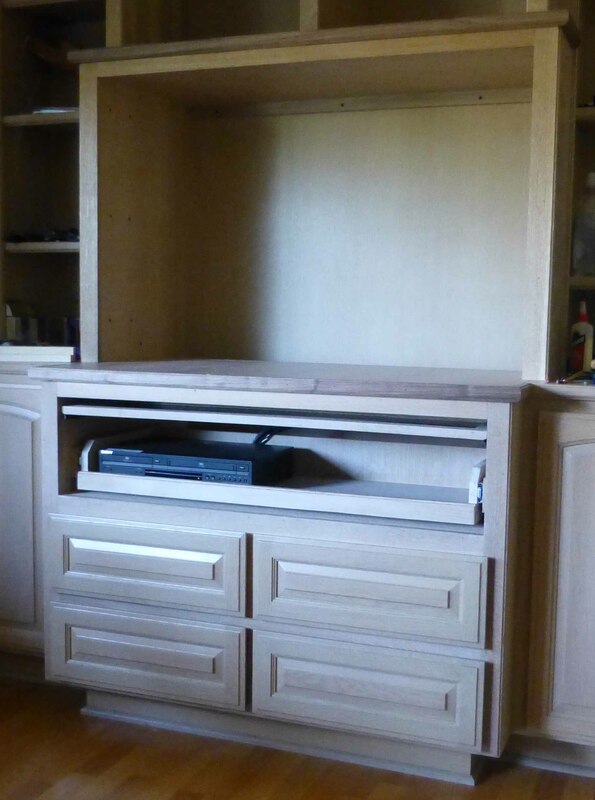 But I haven’t finished the removable storage that will be hidden behind the TV. 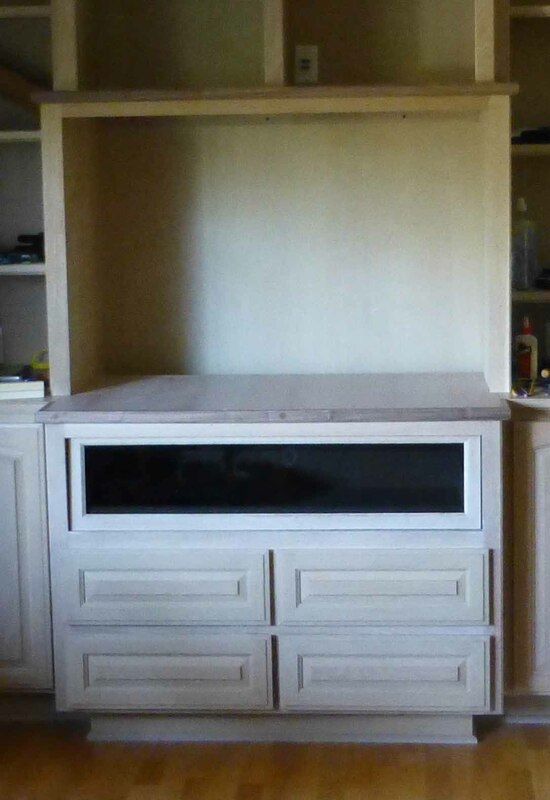 If you look at the second photo in this update, you will see where I plan to install the removable DVD storage in the open spaces behind the TV. 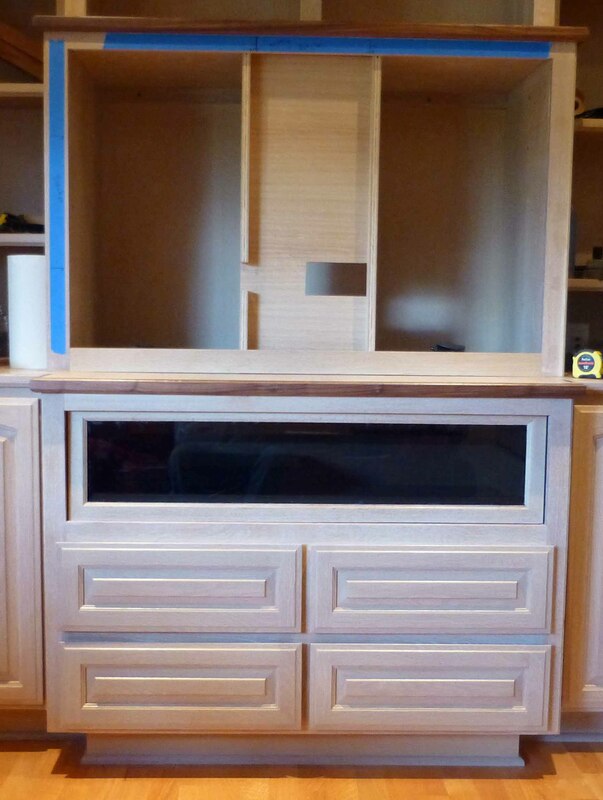 That work can all be done in my wood shop and then slid into place. But first, I want to catch up on my blogging and finish my next book, a teacher’s memoir called “Crazy is Normal, a Classroom Expose”. During one year in the 1990s, I kept a detailed, daily journal of what was going on in my classroom, and I used that as my source material almost twenty years later. Looks really nice. Can’t wait to see the finished product.